Functional appliances are generally only available for children up to the age of about 14 years as they are most effective during active stages of growth. 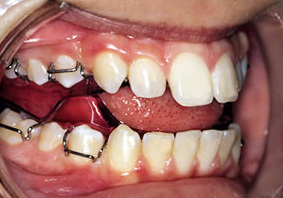 These braces are used to harness the growth of the jaws and improve the way the upper and lower teeth meet. They work by positioning the lower jaw in a forward posture which stretches the muscles of the face and helps to correct protruding teeth. In some cases, these braces encourage favourable growth and help to improve the facial profile. These braces are mostly removable but should be worn as near to full-time as possible. The most popular functional appliances used in our clinic are called twin blocks. Although these braces can be quite bulky, if they are worn well, they can produce great results. Typical treatments can last from 6-12 months. After this time, additional orthodontic (fixed appliance) treatment is often necessary to fine tune the position of individual teeth. Functional appliances are available as an NHS or private treatment option.